ROARING FORTIES™ SMA2000 series dual buoyancy inflatable life jackets are approved by Civil Aviation Safety Authority (CASA - ATSO 1C13). 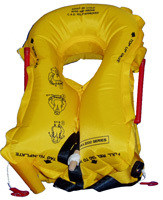 There are many versions of SMA2000 aviation lifejackets. However they all operate with the same system ie with two 18g disposable CO2 cylinders.It has an oral tube, whistle & water activated light.the lifejacket has a buoyancy of 195 Newtons (44lb or 19.95kg) after 24 hours. It takes 3 seconds to right an unconscious individual to an altitude of at least 30 degrees to the vertical with the mouth & nose well clear of the water. SMA2000 has good rear & lateral support & is stable in either direction. The SMA2000 series is available in many packing configurations for different application requirements. Service Life: 5 Years from NEW. Should the package been compromised, it should be checked by an authorised service technician. 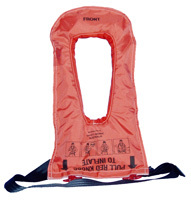 The inflatable lifejacket SMA 2000 is housed in the sealed flame retardant bag. To use, just tear open the sealed bag using the red tag. Follow the instructions on the lifejacket for donning. This lifejacket is designed for passenger use. This a constant wear lifejacket to be worn around the waist. 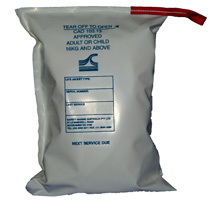 A SMA 2100 lifejacket is packed inside the blue pouch. To use, just lift up the folding flap and take out the lifejacket and put through the head and buckled up securedly. Advisable for pilots, crew members or passengers to familiarise themselves with the simple donning instructions before take - off. This jacket is also very popular with pilots and crew members. This is also a constant wear lifejacket for pilots, crew members or passengers. It has a SMA 2100 lifejacket packed in a neck valise. The donning instructions are depicted on the valise.